The Fulbright Scholar-in-Residence (S-I-R) Program helps institutions advance their international presence by enabling them to apply to host non-U.S. scholars for teaching. In 2018-2019, the Institute of American Indian Arts (IAIA) is hosting linguistics professor Miguel Reyes Contreras from the Intercultural University of the State of Mexico through the Fulbright S-I-R Program. We reached out to the Laurie B. Logan Brayshaw and Stephen Wall at IAIA to hear about the impact of hosting a S-I-R.
How did you and the Institute of American Indian Arts first hear about the Fulbright Scholar-in-Residence Program? Laurie B. Logan Brayshaw (LBLB): David Levin, Senior Program Manager and Diversity Coordinator with the Bureau of Educational and Cultural Affairs at the U.S. Department of State spoke to the Tribal College Presidents at an American Indian Higher Education Consortium board meeting that our President, Dr. Robert Martin, was attending. He suggested that we should apply, and provided an informative 2-page flyer about the program. David Levin was very helpful in guiding me through the application process by answering questions that I had through email and by phone. Stephen Wall (SW): We received an email notice soon after IAIA and UIEM signed a formal agreement for student and faculty exchanges. We followed up on the email and got more information and moved forward from there. LBLB: The application process was relatively uncomplicated. While it was the first time that IAIA has requested a Fulbright Scholar, the process was easy. SW: I was not the only person who was involved in the application process, but my contribution to the application process did not take much time or work. What is Professor Reyes doing on campus? What is the hosting experience like? LBLB: The hosting experience has been great. Professor Reyes has been a wonderful addition to the IAIA family for the 18-19 Academic Year. During the Fall 2018 semester, he has taught 2 credit bearing classes on Spanish and Mexican culture. Professor Reyes has also taught 3 classes in our Continuing Education department on Mexican Modern History and Culture Through Music, Linguistics and Onomastics: A Way of Learning about Language and Culture, and Oulipo for Written Creation. Another class, The Soul Kitchen Feeding Train (Writing, Reading, Performance Art), was offered as a workshop during a lunch time gathering. The classes have brought in members of the greater Santa Fe community who are always eager to learn about other cultures and who continuously attend various lectures and readings at IAIA and throughout the city. Professor Reyes has been able to fit seamlessly into the IAIA and the Santa Fe community, and he is also using this to his benefit to conduct and complete his own research. Professor Reyes has been eager to attend any and all conferences and workshops that are available whether on the IAIA campus or in Santa Fe. His love of learning and teaching has been felt throughout the staff, faculty, and students at IAIA. Professor Reyes is slated to teach 3 credit bearing classes in the Spring 2019 semester, along with several classes in the Continuing Education department. SW: Professor Reyes is doing quite a lot. In addition to Spanish classes and Continuing Education workshops, Miguel is sitting in on a senior seminar class entitled “Indigenous Aesthetics” and is providing a very unique and strong perspective. Miguel has participated in the IAIA Open House and a variety of IAIA community activities and events. He is also conducting his own linguistic research while here in New Mexico. We have been really lucky to have Miguel here at IAIA. He is a self-starter and is not afraid to meet people and share his ideas. This has made our hosting experience to consist of facilitating what he wants to do rather than trying to get him to do things. Miguel has been a real joy to have here at IAIA. What are some highlights of the S-I-R experience so far? LBLB: The highlight has been working with a scholar from another country who is teaching a full load and conducting research at the same time. His eagerness to learn has been inspiring to many of our students. SW: Miguel has done really good work in the classroom and for our community. His classes are very popular and the students are responding well. Miguel has made fast friends with many faculty members and often goes with them to tribal and other community events in the area. How is having Professor Reyes on campus enriching the institution? SW: Miguel is housed in the Indigenous Liberal Studies Department (ILS) and is teaching courses under that department. Since ILS is a culture, history and philosophy oriented department, Miguel is enriching IAIA by bringing a higher level of cultural understanding and a different perspective on many of the topics that we teach. In addition, his personal outreach to faculty in other departments has extended the reach of his influence. LBLB: His first-hand knowledge of Indigenous cultures in other countries has assisted in his teaching, by helping him compare and contrast cultures in his classes and workshops. Do you have any advice for other institutions thinking about applying to host a Fulbright Scholar-in-Residence? LBLB: Santa Fe is a highly priced area for housing. Any institution should be very proactive in helping their Fulbright S-I-R obtain housing that is relatively close to campus and is on a bus route. SW: I think that the success of our S-I-R experience is based on our relationship with Miguel’s home institution. We were able to work with them to set parameters prior moving forward with our Fulbright application. 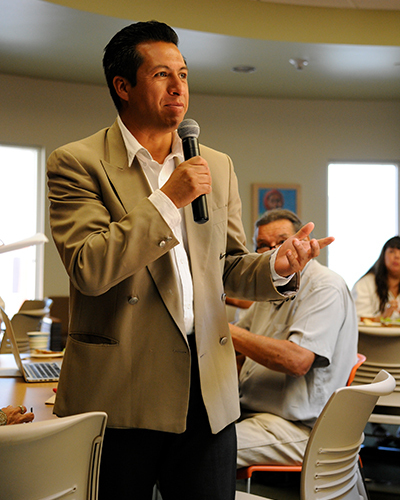 What are your goals for the remainder of Professor Reyes’ SIR tenure at IAIA? How will you collaborate after the grant ends? SW: Miguel is teaching again next spring and in addition to his Spanish classes, but he has asked to teach a linguistics class. I am certain that he will be asked to continue with the Continuing Education workshops. He is enjoying those workshops. One of the reasons that we are so happy to have Miguel is that he has the potential to assist in the implementation of the exchange agreement between IAIA and UIEM, Miguel’s home institution. We hope to have him as an advocate and facilitator for exchange activities with UIEM. Currently, he is our main contact to have students come to IAIA from UIEM this spring semester. LBLB: IAIA is looking forward to having a greater exchange of students between our college and UIEM in Mexico. We hope to keep this connection once he returns, so that our students will have another familiar face on the UIEM campus to greet and guide them.